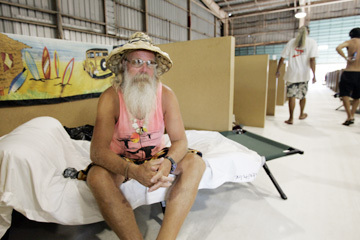 At the "Next Step" homeless shelter at Honolulu Harbor's Pier 1 yesterday, Daniel Schnitzler talked in his cubicle about Mayor Mufi Hannemann's announcement to keep Ala Moana Beach Park closed at night. Mayor Mufi Hannemann announced yesterday that the nighttime closures of Ala Moana Beach Park will become permanent because of overwhelming public support for a policy that displaced hundreds of homeless people. "Ala Moana Beach Park is a much safer, much cleaner and a much more pleasant park to enjoy," the mayor said. Hannemann said the decision to keep the park closed to the public from 10 p.m. to 4 a.m. daily was not done to rid the area of homeless people who camped at the 119-acre park, but because the public wanted Ala Moana cleaned up. "They love the way Ala Moana park looks now," he said. The city started closing Ala Moana park at night on March 27 in advance of a three-day, around-the-clock shutdown for park maintenance. Workers fertilized the park's grass, painted and renovated all six comfort stations, removed accumulated trash and rearranged beach sand that had been eroding, said Lester Chang, city parks director. Hannemann's decision to make the closures permanent was applauded by some park users yesterday. Charles Hansen said the park is cleaner and safer since the city started the nighttime closures. "People couldn't walk up and down without bumping over people with a lot of filth around them," Hansen said while enjoying the sunset with girlfriend Bev Helmer, who also backed the idea. "I don't feel safe walking around the park," Helmer said. "That's why quite a few people are in favor of the park being closed." The closure received unanimous support from the Ala Moana/Kakaako Neighborhood Board, according to Larry Hurst, who has been lobbying for the idea for 10 years. "I would see all the damage being done, and there's no way you could keep up with it" if the park stayed open at night, Hurst said of vandalized restrooms. "It should just be a normal thing." But Daniel Schnitzler, who used to sleep at the park and is now staying at a shelter in Kakaako, said Ala Moana should be open overnight because it offered homeless people a relatively safe place to sleep and shower. He said the closures would simply force the homeless to move into other neighborhoods and parks. "If they can't sleep right here in the park, they are going to go next door and sleep on the edge of another person's house," he said from a small bed inside his cubicle at the shelter. About 150 parks, a little more than half of the city's 293 parks, close at night, usually between 10 p.m. and 5 a.m., Chang said. He said Ala Moana will open at 4 a.m. to welcome early joggers and surfers. "It seems to be a perfect fit," he said, adding that it will be up to police to decide whether joggers who enter the park at night to exercise should be cited. The park will stay open all night on July 3 because of Independence Day celebrations. Under the permanent schedule, the Magic Island parking lot, which has been closing at 8 p.m., will stay open for an additional two hours, Chang said.